The 32.61 metre motor yacht Silver Seas, listed for sale at Worth Avenue Yachts, has had a further $1,000,000 price reduction. An all-aluminium raised pilothouse yacht, SilverSeas was built by Burger Boat Company to a design by Don O'Keefe and delivered in 1998. She features voluminous interior spaces for entertaining and accommodates eight guests in four cabins consisting of a double-berth master suite and three twin cabins, all with en suite bathroom facilities. The saloon of this yacht for sale is paneled in satin finished cherry wood and has comfortable seating on an L-shaped settee and two armchairs facing an entertainment centre including a large television and an updated audio and video system. Forward is a full beam galley with all the latest appliances plus a marble topped dinette seating eight guests for sociable breakfasts and casual snacks. The aft deck comes with a teak table and chairs along with upholstered bench seating at the stern and can be full enclosed and air conditioned. Aft to port is a curved teak stairway down to the wide swim platform. In addition, a full refit of Silver _Seas_ was undertaken in 2012, which encompassed complete replacement and upgrading of all navigational electronics, all entertainment electronics, replacement of all mattresses, linens, and soft goods throughout and a complete exterior paint job. The main engines, generators and shore power management system were all gone through and updated, too. 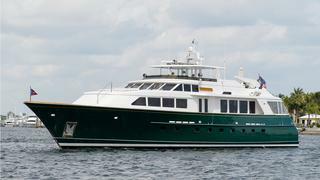 She has a transoceanic cruising range of 3,000 nautical miles at 12 knots courtesy of twin 1,800hp MTU diesel engines. Lying in Palm Beach, Florida, SilverSeas is now asking $4,880,000.